Bars catering to gay women were rare in the first half of the 20th century, but there were at least two on the Sunset Strip that were open in tandem for a while — Jane Jones’ Little Club, at 8730 Sunset Blvd. [map showing approximate site], which operated from 1936 to 1939, and Cafe Internationale, across the street at 8711 Sunset [map], which opened around 1936 and closed in 1942. (Read more about Cafe Internationale and its owner, Tess Wheeler, here.) Both clubs were shut down by the state liquor board, although for different reasons. After Jane Jones’s Little Club opened on the Strip in May 1936, an item in the Times noted that “Jane Jones’ new night spot is getting a big play from the film colonites.” Although there’s no online record of her divorce from Lloyd MacBeth, around this time, if not before, Jane apparently married the club’s co-owner, Raymond P. Babcock. In September 1939, the club was raided by the sheriff’s vice squad. According to the Times, “Quietly entering the cafe with five deputies, Capt. George Contreras, head of the sheriff’s vice squad, dispersed the orchestra and 50 well-dressed guests before making the arrests. Capt. Contreras reported that liquor assertedly was being sold after legal hours.” The club’s liquor license was revoked two months later. Jones never ventured into the nightclub business again. Throughout the 1930s and ’40s, she appeared in 12 films, according to IMDB.com, including the 1938 “Port of Missing Girls,” which can be viewed here online. Jones also continued to perform in nightclubs, including the Melody Room on the Strip and many other venues around town. 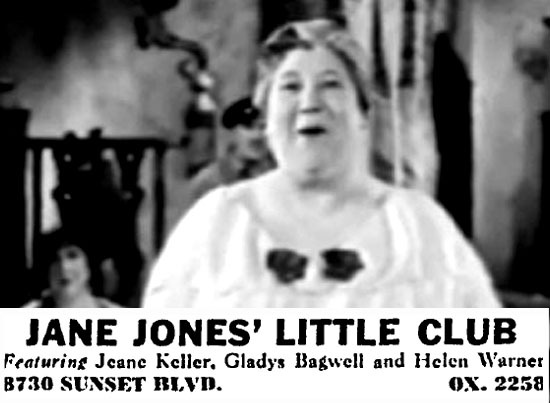 When she died in January 1962 at age 73, the Times identified her as Jane Jones Babcock and said she “sang for many years on the Orpheum and Pantages vaudeville circuits and appeared in a number of motion picture musicals”–and that she had been the proprietor of Jane Jones’ Little Club on the Sunset Strip. The obituary said she had been ill for five months and died at the home she shared with her aunt, Mrs. Sally Hadler, at 327 N. Sycamore Ave.